When J.J. Abram's 2009 reboot of the Star Trek movie franchise came out, I know a lot of us Trekkies (or Trekkers if you prefer) weer surprised with how it came out. And while no movie can please everyone, I think it's safe to say that a lot of us were won over by that movie. Personally, I felt it was a great way to approach a reboot (which is a rare enough statement coming from me) given how Abrams was able to distill the core personalities of the characters and allow them to win out in a completely different environment. Coming into the sequel, I was hopeful but not entirely sure what to expect. I made sure to do my best to avoid all the different spoilers going around and tried to go into the experience with as little knowledge as possible - no easy feat in this social media age. Did I like it? Well, I have to admit that I'm a little confused. There's my effort to be an open-minded movie reviewer trying to balance being a bit of a die-hard Trekkie. There's a lot to like about the movie on both fronts, and naturally some opportunities as well. Synopsis: Star Trek Into Darkness is the sequel to the 2009 Star Trek movie reboot. This movie is also directed by J. J. Abrams with a screenplay by the same writing team of Roberto Orci, Alex Kurtzman and Damon Lindelof. The movie starts with the crew of the Enterprise engaged in a daring rescue mission to save the primitive indigenous residents of the planet of Nibiru. With a volcano threatening to destroy their entire civilization, it appears that only the Enterprise is in a position to save them. However even attempting anything is against the Prime Directive - even if they're trying to avoid being seen by the natives at all in order to stop the volcano. Eventually word of this mission makes it way to Starfleet command and Captain Kirk (Chris Pine) is stripped of his command while Spock (Zachary Quinto) is reassigned to a new vessel. And while they're on Earth, Starfleet Archives are bombed in a daring terrorist attack by some unknown mastermind. Thus Starfleet Command scrambles to implement a security net to prevent the figure from leaving the system. But this bombing is but one step in a greater plan that is yet to unfold. The first act in the movie is essentially a mystery piece as we follow Starfleet trying to figure out what exactly is going on. And Benedict Cumberbatch's character makes for quite the interesting villain - one who is clearly intelligent but also surprisingly physical when he needs to be. He is able to fulfill the role rather well - but then again a lot of us are already sold on his unique speaking voice during long monologues and such. The movie is still quite the visual feast - what else is to be expected from the Abrams envision. Sure you can argue that a lot of the designs are rather impractical and non-functional, but they're certainly pretty and great to look at. In general the effects helped the story along, although I could have done with some of the rather extreme camera angles and unnecessary rotating shots. Like the first movie, this sequel has a lot of little nods to the original series woven into the story. It's a nice way to appeal to longer-term fans of like myself, although some of them are a tad tricky since Abrams really tried to play around with some of the Easter Eggs. Thus we see a lot of familiar items, but often in unusual forms. It almost feels like we ventured back into the Mirror Universe for some of these items indeed. But at the same time a lot of the Easter Eggs became more than just little bonuses that a fan could spot in the background. This time around a lot of familiar names and key scenes were brought into this movie but with completely different backgrounds and such. Thus the fan service was elevated to a new level, but one that left me a little confused given how it's inevitable that we compare these new incarnations with their original versions and wonder why they bothered with the changes at all. On the whole, these Abrams Star Wars are like the old DC Elseworlds comics - the ones that would sort of re-cast various DC heroes in new stories. It's precisely the reason why I accepted the whole time-travel created alternate reality that defined the first movie (and this whole movie universe). But as far as Elseworlds stories go, I think I wouldn't have made some of the tweaks and changes made in the movie to the various characters and such. I have a number of things to nitpick about the movie - but I suppose that's natural being a Trekkie or even just because of my being a geek in general. They're not game-changers and they don't totally take away from one's enjoyment of the movie. However for a story that starts out as a bit of a mystery, some of these little inconsistencies do nag me. And having me in that mindset at the beginning of the movie had me predicting a lot of the eventual plot twists later on. And I don't know if that's based on how predictable the movie was at times or just how good I've gotten at "reading" movies to determine their outcomes. On the whole, the movie was a decent enough adventure piece with a lot of classic movie moments that felt like they were lifted right out of Star Wars. And given that Abrams is now in charge of that franchise as well, I can certainly see that he'll do a good job there. But at the same time, I'm not sure if that approach is what is "best" for Star Trek since I can't help but feel like we lost a lot of the intellectual discourse that had previously defined Star Trek stories. As much as the original Kirk had more than his fair share of swashbuckling adventures, he was still a thoughtful leader who was blazing a trail for the rest of the Federation. Here we're left questioning whether or not he was truly reader to become Captain. 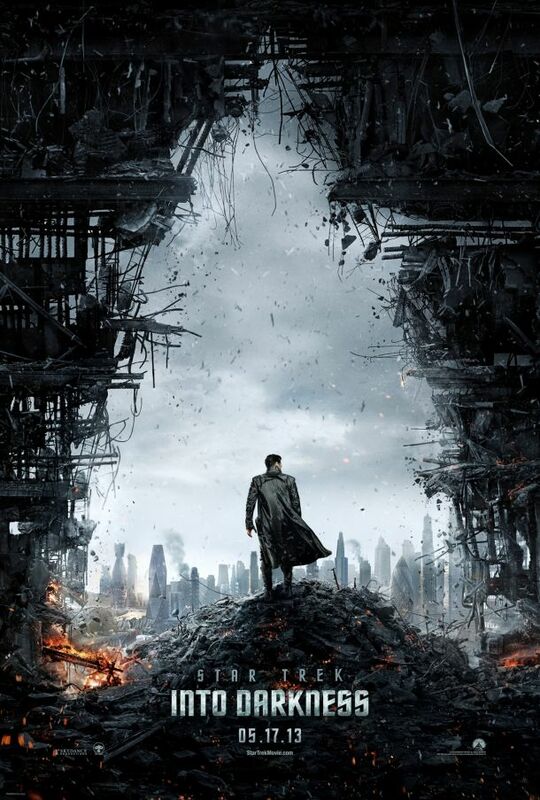 Star Trek Into Darkness is a pretty respectable movie on its own and a good addition to the Star Trek franchise as a whole. I still feel that the prior movie was stronger but that doesn't mean this movie is bad in official contrast. So the movie rates as 3 genetically modified humans stored in torpedoes out of a possible 5.